The Federal Reserve has the historical monthly average paid for 30 year fixed mortgages at this page. They give the monthly % rate for 30 year fixed mortgages for 1971 to 2008. For the 37 year period from 1971 to 2008 the average rate was 9.11% and the median was 8.58%. Mortgages ranged from a minimum 5.23% in June 2003 to a maximum 18.45% in Oct. 1981. December 2008 was at 5.33% so its very close to the minimum we hit in 2003. 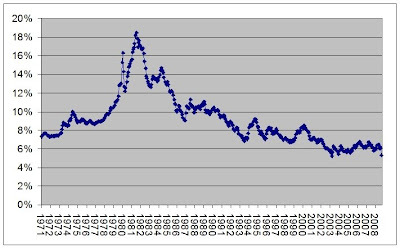 January 2009 should probably set a new low for rates post 1971.